We are super excited to have been asked to take part in the Dorothy Perkins Style Essentials campaign for the 2nd season! We took part in the SS14 style essentials and we are super excited to share our AW one with you all. We love a good style challenge and couldn't wait to style up our 2 style essentials which this season is 'The Shirt' and 'The Fur'. See the other blogger ladies style essentials HERE! The first style essential is 'The Shirt' DP have such an amazing range of shirts for all occasions which you can shop HERE. I chose this perfect floral longline shirt which is easy to be dressed up or down and I can't wait to layer it under jumpers and coats for AW. With the weather still being so warm I teamed the shirt with a clashing floral blazer which I thought added a nice twist to the outfit and complimented the shirt well. I wanted a smart but young look still playing on my playful dress sense and print mixing. The black midi skirt was the perfect shape and length with the busy top half detail and finished it of with a little white belt and black clutch. The peep toe grey sandals were my godsend over LFW as they are so unbelievably comfortable and look great with any outfit. I decided to finish of the look with my burgundy big hat and a matching lip for a nice transitional AW look which is good for any occasion. For a more dressed down look I would team the shirt and blazer with skinny jeans or swap the blazer for a biker jacket. A printed shirt is definitely one of my wardrobes staples that I can't live without and a key layering piece which can add interest and depth to your AW wardrobe. I love the way you styled the shirt...it's a very bold look. I usually shy away from patterns and prints myself, but I totally admire your ability to pair different prints and colours so incredibly effortlessly. I like the shirt, I like the jacket, I like the hat.. I like everything! I'm looking for a hat like yours and I especially like this colour. 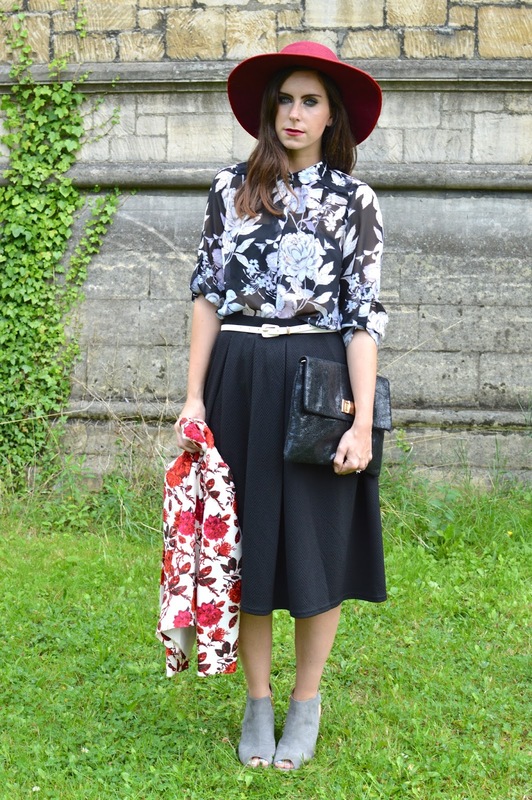 Love the wide-brimmed hat! Super cute.